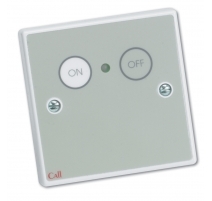 Provides audible and visual indication of 800 Series Alarm calls outside bedrooms, WCs and any other area fitted with an 800 Series calling device. 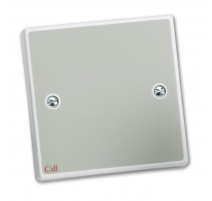 Indicates Standard calls via a constant tone/constant red light and Emergency calls via a pulsing tone/pulsing red light. Dual red LEDs and triangular diffuser make it highly visible from a distance. Can also be used as an 'area indicator' at corridor junctions, staff workstations, etc. 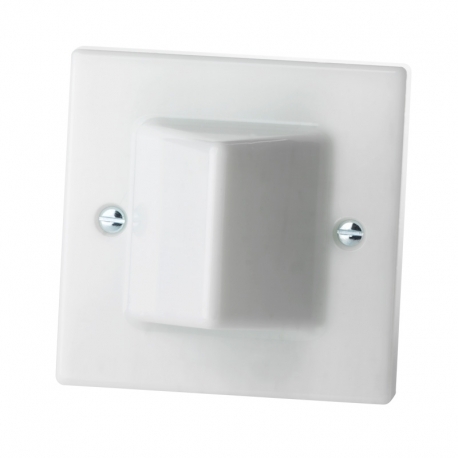 Also available as part of the NC951 Accessible Toilet Alarm kit. Stainless steel version also available. Indicators Dual ultra-bright red Alarm LEDs (lit constantly for standard calls, intermittently for emergency calls). Controls None (the device is controlled by the master calling device it is connected to). Connections 1 (Signal); -Ve (Negative); +Ve (Positive). Onboard Sounder Yes. Sounds constantly for standard calls, intermittently for emergency calls. Product dimensions (mm) 87 W x 87 H x 68 D mm. Mounts on a UK 25mm single gang back box.